InSanity lurks Inside: "Rock Your Disney Side" with Disney's 2014 24 Hour Event! 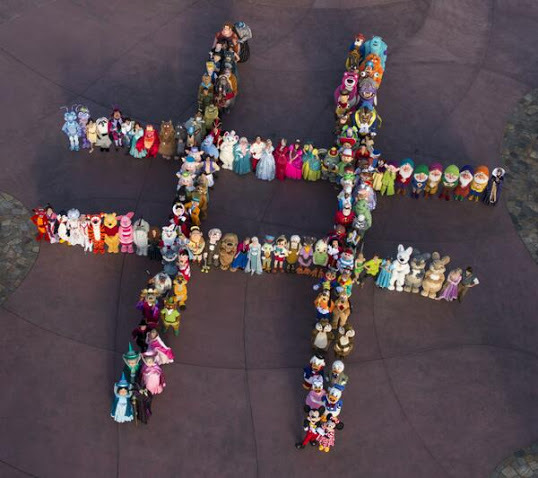 "Rock Your Disney Side" with Disney's 2014 24 Hour Event! Last year Disney opened up the doors to their parks for a full 24 hours in February, giving guests the chance to party and enjoy the park for complete day. Given how successful it was, it's no surprise that they've decided to bring it back in 2014. This coming Memorial Day Weekend, you'll be able to enjoy either Disneyland or Disney World's Magic Kingdom from 6am-6am, May 23rd-24th. Best of all, is that like Mickey's not so Scary Halloween, you're invited to dress up to join the revelry. Yep, that's right, another one of those rare occurrences where adults can have some fun in costume at the parks! The official site for the event has a list of all the rules and restrictions on costumes, but also a bit more information about the events that will be taking place. One really cool thing, the villains will be out and about in the parks, which is always awesome to see. They seriously don't get enough love in the parks these days. Also, no clue on what "select rides and attractions" will be open just yet, but it's safe to say (and expected) that not everything will be running in the middle of the night. Just what will be? No earthly idea right now. Given that this is on a holiday weekend, expect the place to be packed and completely insane. Personally, I don't get why they decided to do it Memorial Day, as a slower time of year might be a better fit (like last year). Either way, if you're going or planning to go, just be prepared for lines and big crowds! For more information head on over to Disney's official event page!